How Do Companies Make Any Money in Digital? In 2007 I wrote a paper that analyzed the lack of investment from 2001 to 2006 in the basic infrastructure of ad technology. The dot-com bubble burst had a chilling effect on investment in the ad tech space, and as an industry we focused for about six years on short term gains and short term arbitrage opportunities. This period saw the rise of ad networks and was all about extracting any value possible out of existing infrastructure, systems, and inventory. So all the “remnant” inventory in the space, the stuff the publisher’s in-house sales force couldn’t sell, got liquidated at cheap prices. And those companies with the willingness to take risk and the smarts to invest in technology to increase the value of remnant got off the ground and succeeded in higher efficiency buying and selling, and lived off the margins they created. But we lost an entire cycle of innovation that could have driven publisher revenue higher on premium inventory – which is required for digital to matter for media companies. There’s been lots of discussion about the drop from dollars to dimes (and more recently to pennies) for traditional media publishers. And while the Wall Street Journal and New York Times might be able to keep a pay-wall intact for digital subscriptions, very few other publications have managed it. A lack of automation meant cost of sales for publishers, and cost of media buying management for agencies, were vastly higher in digital (greater than 10x what those things cost for traditional on both the buy and sell side). Prices were stagnated in the digital space because of an over-focus on direct response advertisers, and the inability of the space to attract offline brand dollars. Market inefficiency had created a huge arbitrage opportunity for third parties to scrape away a large percentage of revenue from publishers. Where there is revenue, investment will follow. There was a need for targeting and optimization that existing players were not investing in, because the infrastructure that would empower it to take off didn’t exist yet. Significant investment would soon come from venture capital sources that would kick start new innovation in the space, starting with infrastructure and moving to optimization and data, to drive brand dollars online. Six years later, this is where we are. I did predict pretty successfully what would happen, but what I didn’t predict was how long it would take – nor that the last item having to do with brand dollars would require six years. This is mainly because I expected that new technology companies would step up to bat across the entirety of what I was describing. Given that the most upside is on brand dollars, I expected entrepreneurs and investors to focus efforts there. But that hasn’t been the case. So what’s the most important thing that has happened in the last six years? The entire infrastructure of the ad industry has been re-architected, and redeployed. The critical change is that the infrastructure is now open across the entire “stack” of technologies, and pretty much every major platform is open and extensible. This means that new companies can innovate on specific problems without having to build out their own copy of the stack. They can build the pieces they care about, the pieces that add specific value and utility for specific purposes – e.g. New Monetization Models for Publishers and Brand Advertisers, New Ad Formats, New Ad Inventory Types, New Impression Standards, New Innovation across Mobile, Video and Social, and so on. So who will make money in this space, how will they make it, and how much will they make? I’ve spent a huge portion of my career analyzing the flow of dollars through the ecosystem. Recently I updated an older slide that shows (it’s fairly complex) how dollars verses impressions flow. The important thing to take away from this slide is that inventory owners are where the dollars pool, whether the inventory owner is a publisher or an inventory aggregator of some kind. Agencies have traditionally been a pass-through for revenue, pulling off anywhere from 2 to 12% on the media side (the trend has been lower, not higher), and on average 8 to 10% on the creative side depending on scale of the project. 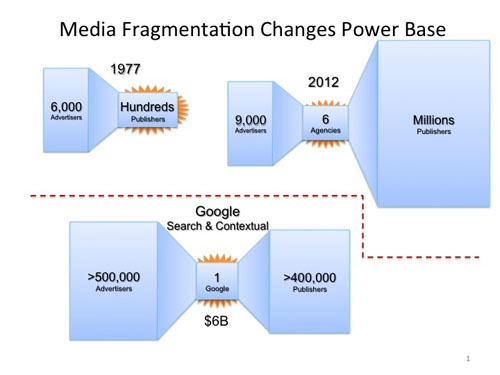 Media agencies are not missing the point here, and have begun to experiment with media aggregation models, which is really what the trading desks are – an adaptation of the ad network model to the new technology stack and from a media agency point of view. The piece of this conversation that’s relevant to ad tech companies is that so far in the history of this industry, ad technology companies don’t take a large percentage of spend. In traditional media, the grand-daddy is Donovan Data Systems (now part of Media Ocean), and historically they have taken less than 1% of media spend for offline media systems. In the online space, we’ve seen a greater percentage of spend accrue to ad tech – ad serving systems for instance take anywhere from 2 to 5% of media spend. 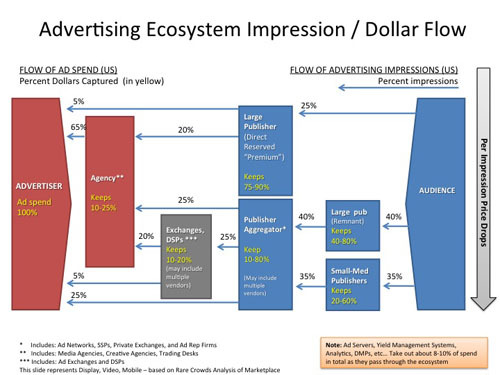 So how do ad tech companies make money today and going forward? It’s a key question for pure transactional systems or other pure technology like ad servers, yield management systems, analytics companies, billing platforms, workflow systems, targeting systems, data management platforms, content distribution networks, and content management systems. There’s only so much money that publishers and advertisers will allow to be skimmed off by companies supplying technology to the ecosystem. In traditional media, publishers have kept their vendors weak – driving them way down in price and percentage of spend they can pull off. This is clearly the case in the television space, where ad management systems are a tiny fraction of spend – much less than 1%. In the online space, this has been less the case, where a technology vendor can drive significantly more value than in the offline space. But still it’s unlikely that any more than 10% of total media spend will be accepted by the marketplace, for pure technology licensing. This means that for pure-play ad tech companies with a straightforward technology license model – whether it’s a fixed fee, volume-based pricing, or a percentage of spend – the only way to get big is to touch a large piece of the overall spend. That means scaled business models that reach a large percentage of ad impressions. It also means that ultimately there will only be a few winners in the space. But that’s not bad news. It’s just reality. And it’s not the only game in town. Many technology companies have both a pure-technology model, and some kind of marketplace model where they participate in the ecosystem as an inventory owner. And it’s here that lots of revenue can be brought into a technology company’s wheelhouse. But its important to be very clear about the difference between top-line media spend verses ‘real’ revenue. Most hybrid companies – think Google for AdSense, or other ad networks – report media spend for their marketplaces as revenue, rather than the revenue they keep. This is an acceptable accounting practice, but isn’t a very good way to value or understand the value of the companies in question. So ‘real revenue’ is always the important number for investors to keep in mind when evaluating companies in this space. Many ad technology companies will unlock unique value that they will be the first to understand. These technology companies can capitalize on this knowledge by hybridizing into an inventory owner role as well as pure technology – and these are the companies that will break loose bigger opportunities. Google is a great example of a company that runs across the ecosystem – as are Yahoo, Microsoft and AOL. But some of the next generation companies also play these hybrid roles, and the newest generation will create even greater opportunities.